The Belkin Powerhouse Charging Dock Duo ensures you'll never go without a well-charged phone or tablet. The dual cradles make it the only dock you'll need - perfect for all your Apple Lightning connector devices. 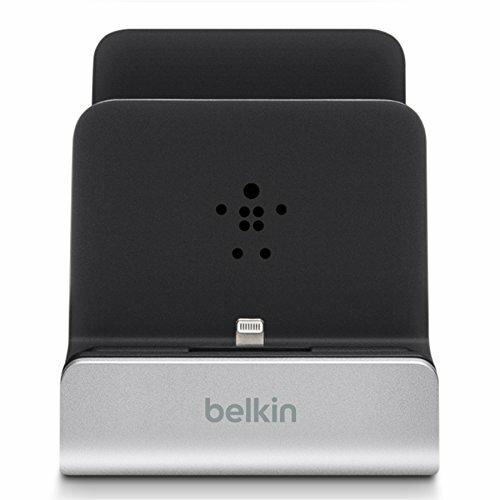 The Belkin Powerhouse Dock Duo is significantly smaller than the smallest dual dock on the market, making it compact enough to put just about anywhere, even your nightstand. Dock any two Apple Lightning devices at once and charge both at the fastest possible speed. At 2.4 Amp/12 Watt each, the Belkin Powerhouse Dock Duo can charge two iPad Air tablets 40% faster compared to 5 Watt charging. The included power supply with 4-foot cable plugs directly to the wall to keep your desk, nightstand or workstation looking neat and tidy. The Belkin Powerhouse Charging Dock Duo features dials on the back of each cradle that raise and lower the built-in Lightning connectors to fit your device with or without a case on. It makes docking extra fast and easy because you don't have to worry about taking your case off first.